A common application for the QPV is to pilot operate an Equilibar® Back Pressure Regulator (BPR). The Equilibar QPV is a high resolution electronic pressure regulator providing a regulated output pressure that is proportional to an electrical command signal input. The QPV is available in a wide range of calibrated pressure ranges covering vacuum through 150 psig /10 bar(g). 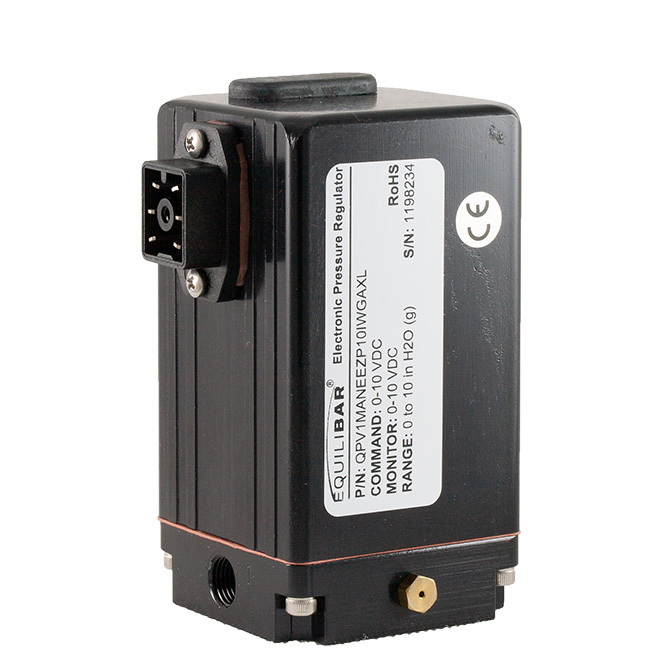 The QPV is available in either 0 -10 VDC or 4-20 mA analog signal types. The QPV is a relatively low flow regulator, making it a great choice any time low flow rates or small volumes require precise pressure control. The QPV is often used to provide the pilot pressure signal to the dome of either an Equilibar® back pressure regulator or an Equilibar® vacuum regulator. The QPV can then be used to electronically control back pressure or vacuum pressure in line sizes from 1/8 inch through 4 inch by pilot operating the appropriately sized regulator. board, and a pressure transducer all contained in a protective IP65/NEMA4 housing. Pressure is controlled by the use of two solenoid valves. One valve functions as inlet control and acts to allow supply media into the system to increase the controlled pressure. The other solenoid valve acts as the exhaust and will decrease the controlled pressure by venting to atmosphere. The inlet solenoid valve operates in a proportional manner to the current supplied by the QPV’s electronic control circuit. This variable orifice affect allows precise control of pressure at low flow conditions and avoids the digital steps of traditional ON/OFF solenoids. The ability to vary the inlet solenoid valve orifice opening in an analog fashion allows the QPV1 to control pressure with extremely high resolution. The exhaust solenoid is a standard ON/OFF solenoid and allows excess media to be vented from the system. The regulated pressure output is measured by a pressure transducer internal to the QPV1. This pressure transducer provides a feedback signal to the QPV1’s electronic control circuit. The control circuit compares the internal sensor feedback signal to the command signal input. Any difference between the two signals causes the appropriate solenoid valve to open, allowing flow in or out of the system. Accurate pressure is maintained by controlling these two valves.